NEW YORK (October 29, 2008)– The National Hockey League (NHL) and Carlton Books have teamed up to release The Official NHL Hockey Treasures, a special edition book created by Toronto author Dan Diamond in association with the Hockey Hall of Fame. The book tells the rich and fascinating history of hockey through hundreds of photographs and an exhaustively researched and lucid text. The Official Treasures of NHL Hockey explores the origin and evolution of hockey, with particular attention to the professional game in North America, the players, legendary match-ups and illustrious teams. Available now, this collectible book includes a stunning assortment of removable facsimiles of hockey memorabilia selected by the curators of the Hockey Hall of Fame. 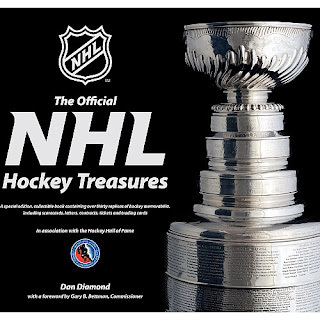 The Official Treasures of NHL Hockey is now available at all book stores across the United States and Canada, as well as at NHL Powered by Reebok Store in New York City, and the NHL’s official online store, Shop.NHL.com.